Please you can login with your existing username and password from this forum. Please try and use the new forum as much as possible. If anything major bad happens we will come back here but I'd like to try the new forum for a trial period of a couple of days or so. * The categories have been slightly reorganised. Mainly I've create a top level Wugger Only category. With some nice sub-categories. I will in future make the wugger user group (which gives access to that category and it's sub categories) automatic allowing much wider participation in that. * Groups are slightly different. Had to redo them by hand so please don't take offence. * Titles follow one group. Not sure which titles get preference. * There is now a few dedicated support categories. These categories also allow the original poster to select a reply as the solution. Giving the person who helped him some kudos. * Badges are there to be earned... Try and find them. * Email support is really good on this forum. There is digests emails, tracking of topics and threads and even whole categories. * Avatars are there but for some they have changed to gravatars. * You can @mention @users, @committee, @networkadmin, @gamingadmin etc etc on the new forum. Please report any major issues in this thread. Incomplete at this stage: Likes/thanks from old forum have not been transferred yet Not all attachments made it, for reasons unknown. I will probably not fix this. I left PMs behind as mentioned before. I've simplified the groups somewhat. I still need to add all the mods. This is one by one thing. Please be patient. Comms are mods for now. Let me know if I missed something. This is in the site feedback category which is for discussions about the new forum. So what's happening to the front page? 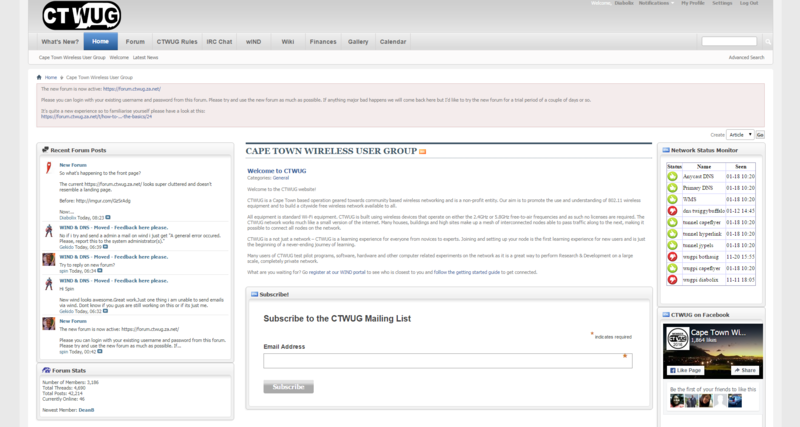 The current https://forum.ctwug.za.net/ looks super cluttered and doesn't resemble a landing page. If I was a new user, I would immediately be confused and just leave the site. If this isn't the 'planned' final page and just a rush to move everything to the new server, can I suggest in keeping the current forum active until the final version is done? As a mod, why was this thread locked, did I miss something? I would think we should be able to post our opinions on this thread until we completely move over to the new system. Edit: I see now you asked us to voice our opinions on the new forum. Ek wil jou rerig help. Ek wil rerig weet of dit fout is met iets. Maar jy moet so bietjie informasie gee. Op die internet of net op die wug? 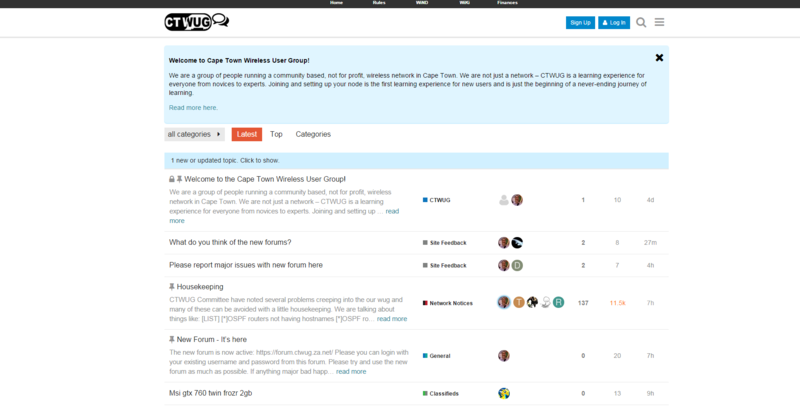 Het jy 'n tracert gedoen na forum.ctwug.za.net? Dit load net op die browser. Die ping is ne te bad nie. Die server is in die UK. Ek try gou van die server na jou. Werk wind? Het jy nog 'n browser op jou pc? explorer doen dieselfde en wind werk ook nie. Dis die eerste keer wat ek probeer. I thought that the ssl_protocols parameter was order agnostic but it appears not.